Jo-Ann Matiachuk coordinates Broadmoor Baptist Church’s ESL program. Interesting questions get asked at Broadmoor Baptist Church’s English as a Second Language (ESL) classes. ESL students at Broadmoor, in Richmond, aren’t just learning a language, they are being welcomed by a community and taught English through explanations of Canadian and Christian culture. Broadmoor offers six levels of classes to about 125 new immigrants and refugees in eight- and 10-week courses throughout the year. “Our program has it roots about 13 years ago when the church was offering Cultural Connections Conversations, reaching out to the [primarily Chinese] neighbourhood. At some point these became structured ESL classes two mornings a week,” says Broadmoor’s ESL coordinator Jo-Ann Matiachuk. The classes are so successful that there is a wait list of about 40 people and line-ups out the door at registration time. The church doesn’t advertise and sometimes has to ask students not to tell their friends because the demand is so great that the church doesn’t have the space or volunteer capacity to expand its courses. June Wasnick leading a casual conversation. One of the reason’s for the ESL program’s success is the desperate need new immigrants have to learn English and become familiar with Canadian culture. Another is the sense of welcome, belonging and community the church provides the students. “This is a life-giving ministry. The students are so grateful they are often in tears,” says Jo-Ann. “There is a sense of welcome ¦– just teaching the language is not enough. They come to a place where they feel understood, where they are taught with patience and kindness, and where they know we recognize they have lives outside of learning English. The Broadmoor ESL program runs like a school, using the six-level Ventures ESL curriculum from Cambridge University Press; it is correlated to government ESL standards. The classes are staffed by about 25 trained Christian volunteers. Students pay a nominal fee of $85 for a 10 week course and less for shorter sessions, to cover the church’s expenses. Almost all of the students have an Asian background, usually from mainland China or Taiwan; about 85 percent are women, many of whom are isolated in Canada because their husbands are earning a living in their home country. The church takes advantage of seasonal opportunities to teach students about Christian symbols and traditions around Easter and Christmas during classes and in after-class conversation groups. About 30 students regularly participate in Bible studies. Each mid-morning break several retired men from the church make and serve coffee, tea and cookies, “which the students think is wonderful, just because it is done for them, and partly because it is men doing it and they get a sense of our culture,” says Jo-Ann. Some teachers form strong bonds with students, praying for them and walking with them through difficult moments in their lives. 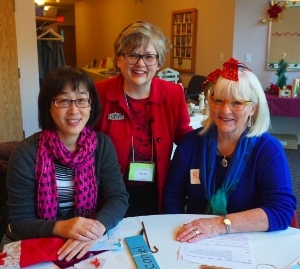 Teachers Margaret Chen, Jo-Ann Matiachuk and Ruth Mukai at the annual Christmas Conversation Cafe. Broadmoor doesn’t measure the success of its ESL ministry by church attendance, although Jo-Ann notes that a few students have been baptized, some attend Broadmoor services and others attend other churches. “It can take a while to see evidence of faith, and we let the students know about church services and Bible studies, but simply by sharing the word and being in a community of support, some will find God,” says Jo-Ann. “The need for ESL classes is so great, every church could offer ESL and it still wouldn’t be enough,” Jo-Ann says. This need will only grow as Syrian and other refugees clamour for ESL training. She advises churches interested in starting an ESL ministry to observe programs offered by other churches to imagine what it might look like in their own context and to get a sense of the possibilities. Finding good curriculum rather than inventing their own would also be helpful. It would also be wise to start small, with a few trained volunteers, and to let new volunteers practice by team-teaching with more experienced language instructors. 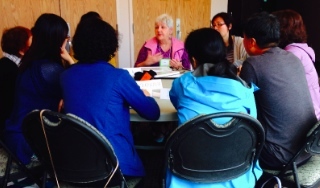 Anyone interested in exploring ESL programs for their church can contact Jo-Ann at esl@bbchurch.ca. 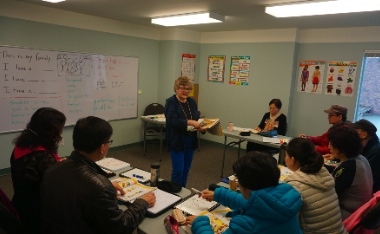 Broadmoor is one of many Canadian Baptists of Western Canada churches across Western Canada offering ESL classes. Among those involved in Vancouver are West Point Grey Baptist Church, Trinity Baptist Church, First Baptist Church and Ward Memorial Baptist Church.